We Won! "Issa attempt to outlaw Vista protests fails." 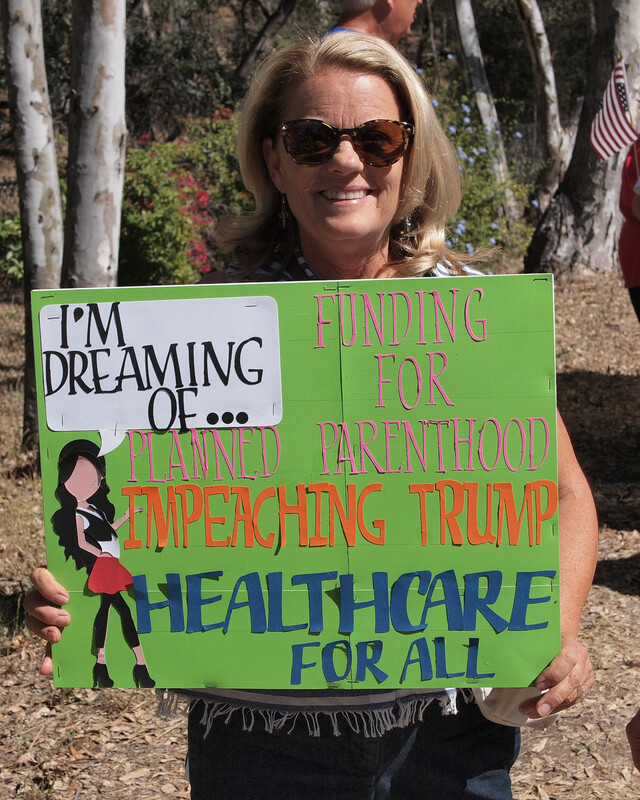 Per the Courthouse News Service article, "Hundreds of constituents who’ve gathered to protest at Republican Congressman Darrell Issa’s Vista, California, office for months on “Resist Trump Tuesdays” were handed a victory by the city this week when their special-events permit was extended for three months and restrictions were removed, despite the congressman’s objections." You might also enjoy reading the Escondido Grapevine article. We had another lively crowd this time, and shared our dreams for America. See more photos here and here. There will be NO rally at Issa's Office on July 4th, but join us on July 11. We had more than 350 people at the rally on June 27. Let's keep it up! 5:00 p.m. to 6:00 p.m. - El Camino Real and Encinitas Blvd in front of the Ford dealership. For more information, check encinitasunity.com. We'll be back in force on July 11! Please join us. 11:00 a.m. - On July 15th, come out to support our local LGBTQA community and march by their side at the Gay Pride Parade. Find out more here. While Congress is on recess this week, there is lots going on. As of now, the Senate is planning on voting on TrumpCare when Congress is back in session. But there are many other bills moving swiftly through the House and the Senate that need our attention as well. Learn about some of these bills in this week’s briefing. In celebration of our country’s birthday, call your friends in red states and urge them to call their governors and Senators and demand that they oppose TrumpCare. We love our country! Let’s stand up for it! Call your friends in Red States to encourage them to contact their Senators and Governors to fight AHCA. Apparently, governors are now contacting the Senators, telling them that the Senate bill is a very bad idea. REMINDER - Use social media to fight back against Issa's game plan. The RNC, RNCC, and Special Interest groups are now moving financial support to the Darrell Issa re-election campaign and efforts. Their first priority is Social Media. Operation Veracity has been tracking Issa’s online activity since January, and is now seeing an up-tick in movement and social interaction. Please counter Darrell Issa's fact-free comments posted via his Twitter and Facebook accounts.